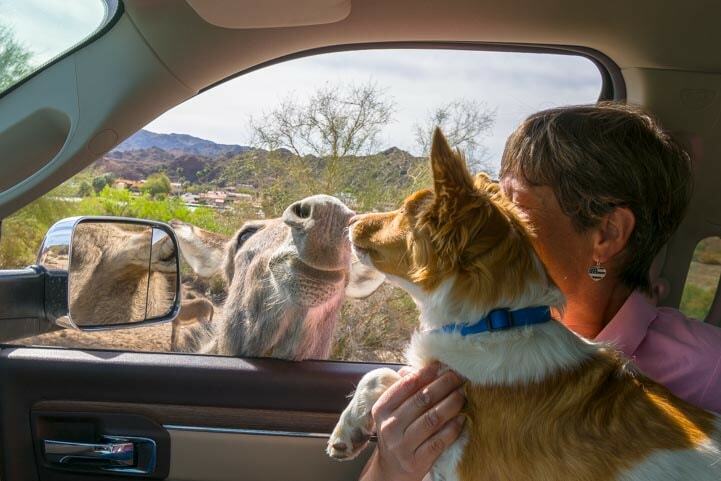 This entry was posted in Arizona and tagged Arizona, Arizona Animals, Arizona Northwest, New, Travel, USA, Wildlife, WP Travel by Roads Less Traveled. Bookmark the permalink. How cute! 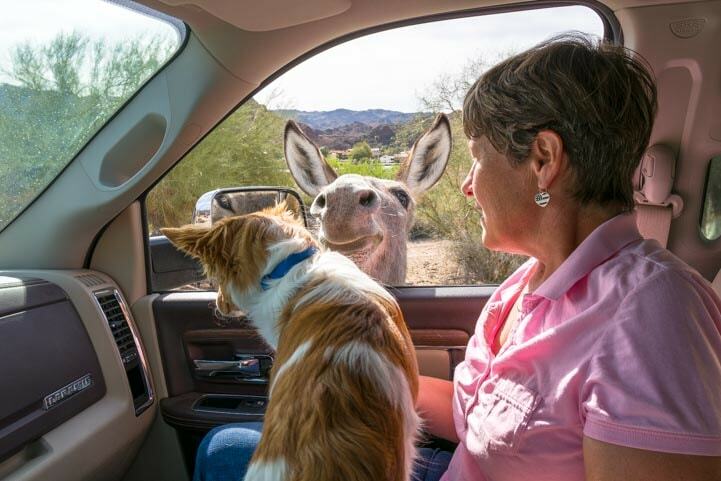 Buddy is the most charming dog ever, and the burros were adorable too. 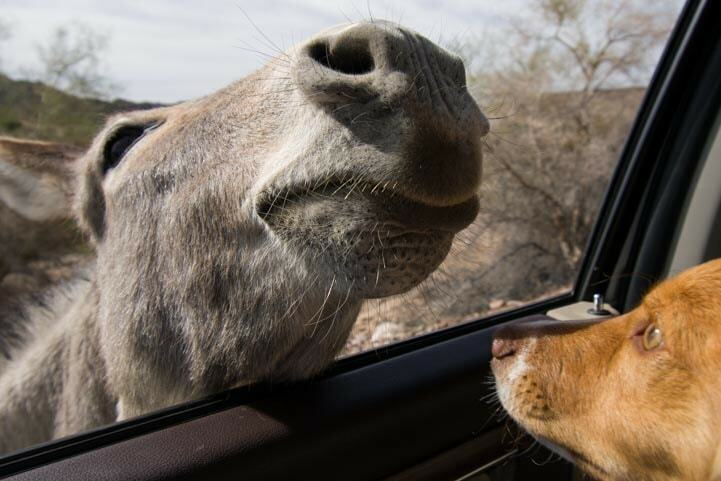 Touching noses between animals is a lovely sign of acceptance. What a great experience — thanks for sharing! It really was special, Emily. I was very surprised by how calm the burros were and how calm Buddy was too. He’s been around horses, and they’ve seen lots of dogs, I’m sure, but the curiosity and interest in getting close was very cool! How cool, thanks for sharing. 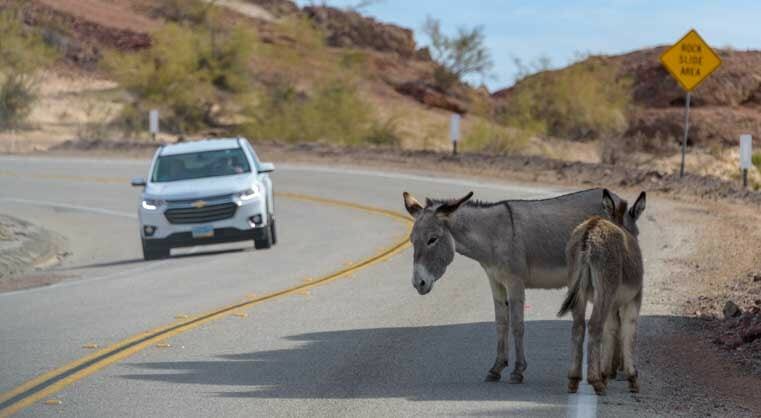 We did that same drive in 2015 and also saw the burros. Actually, I think we saw you guys too, walking the overpass across I-10 in Q, and stopped to chat briefly. Really enjoy your blog, photos, and articles. OMG!! We still talk about that encounter over I-10 in Quartzsite. It is so fun when we meet people who have discovered our blog and appreciate it. Thank you for continuing to follow us. We’ve looked for you each time we’ve walked over that overpass since then! 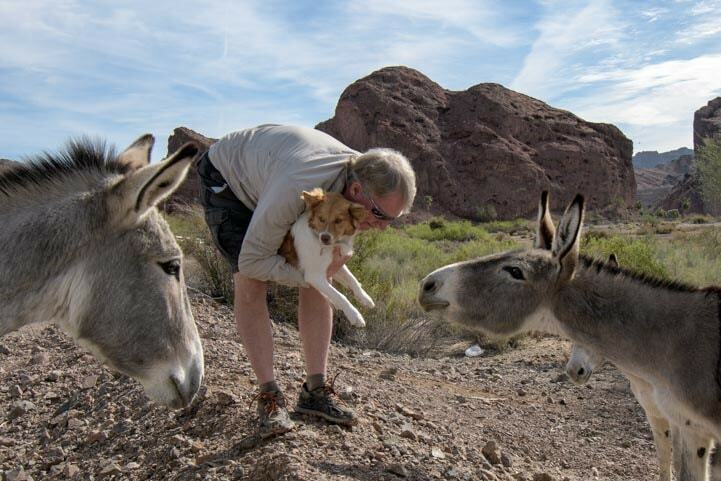 Oh how cute with Buddy and the burros! 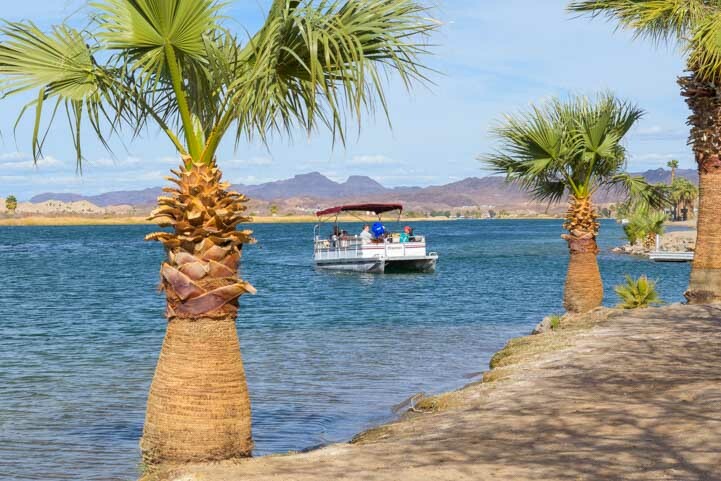 Your pictures made me smile this morning 🙂 And the landscape is pretty neat too…love the contrast of water and dessert and that palm tree!! Buddy is a little extrovert and he loves everyone, whether furry or not. 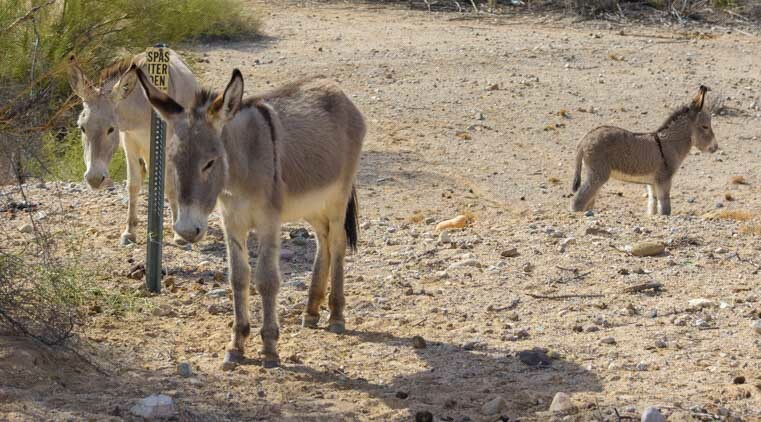 The burros were just another group of potential friends for him!! And the desert-and-water landscapes are truly exquisite. They are everywhere all over the southwest if you seek them out. We’ll be bringing a few more to you!! 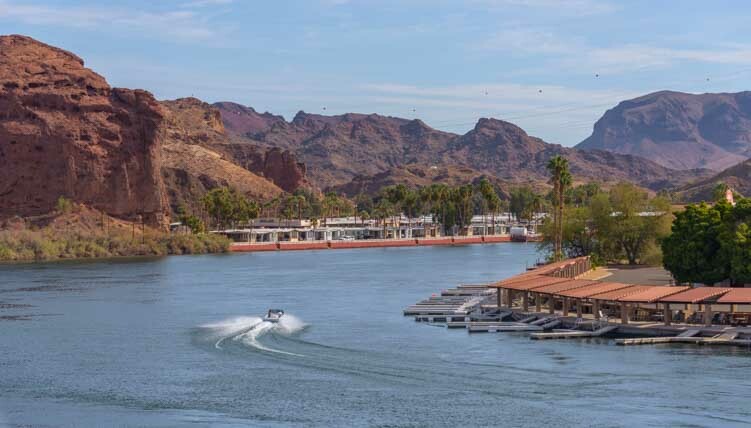 I grew up in Lake Havasu (1967-1980), and spent a lot of time around the Parker area. Thanks for the trip down memory lane for me. You are welcome, Jeff. It’s a pretty area, and seeing how busy and popular it is these days has made us both wonder what it was like a few decades back. It must have been extremely quiet — a little known Arizona gem — in those days. What a cool place to grow up! Thank you, Jill. Buddy has wrapped us both right around his little fuzzy paw. 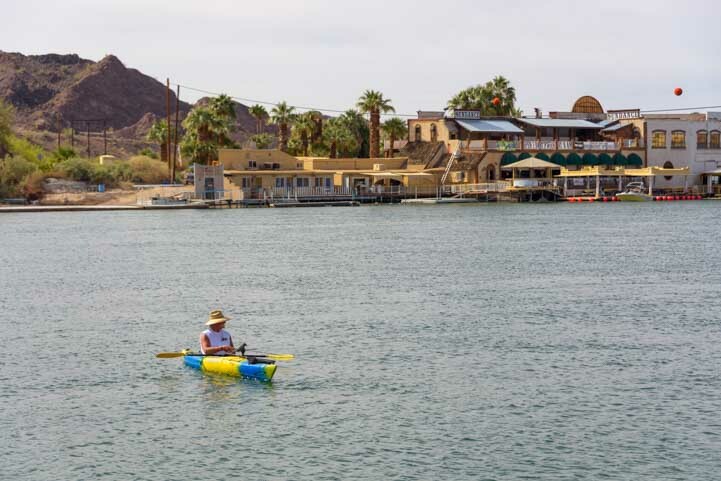 In the eighties and the nineties, I use to organize canoeing trips on the Colorado River from Blythe, CA (actually it was from Walter’s Camp) to Imperial Dam, north of Yuma, AZ. These were not commercial trips, just fun-for-the-weekend float trips amongst friends and acquaintances. Getting away from city life for a few days of R&R in a semi-wilderness environment provided a much needed and relaxing change of pace, only three hours from home. 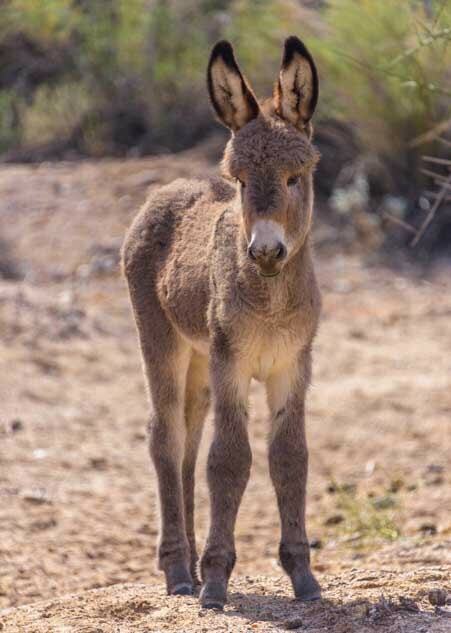 Often, we would be awakened early in the morning by the braying of burros or the whinnying of wild horses, and as soon as someone would arise from his sleeping bag, the horses would leave. It sure beat the cacophony of car, truck, motorcycle and airplane noise heard from my bedroom at home! What great trips those must have been, Don. “The River” is still alive with boating activity, and I’m sure there are folks who canoe down it and camp along the way even today. Thank you for sharing your wonderfully vivid memories! So wonderful to read this post just as I was thinking of a day trip we could take today! We are set up in Yuma and Q is just a short hop from here. We’ve seen lots of wildlife but we always want to see more. Thanks for the idea. You are welcome, Laurel. Parker is 120 miles from Yuma, but that’s not too bad with some good tunes and good company. 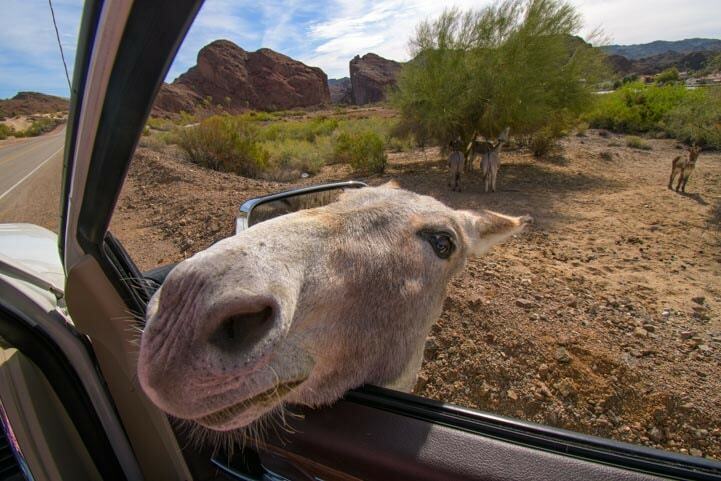 Have fun on the scenic drive between Parker and Parker Dam, and say hello to the burros for us! 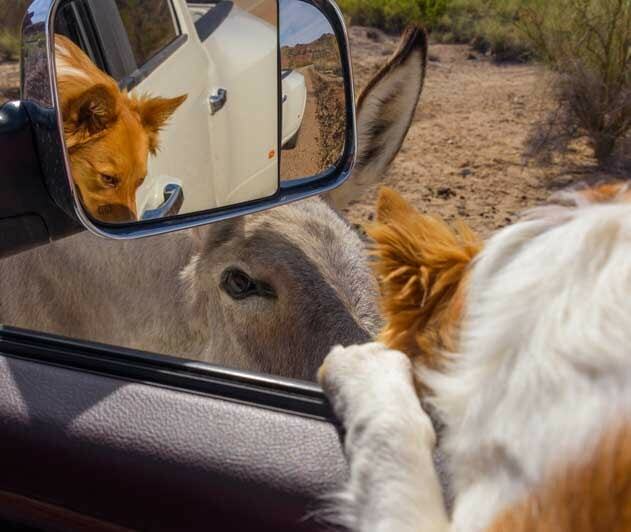 Buddy lights up every post….”nose-to-nose” was delightful !! 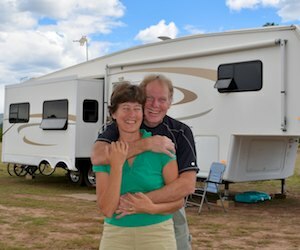 And the size of the RV camp grounds is amazing…. Buddy has been lighting up our lives ever since his arrival and is a wonderful addition to everything we do! 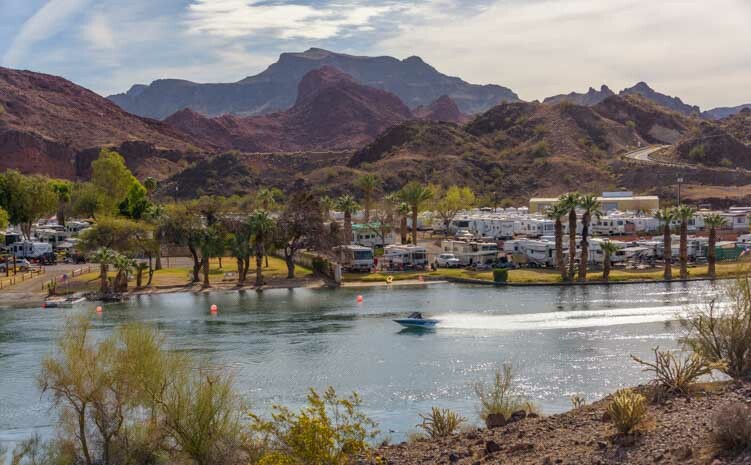 The area between Parker and Lake Havasu has a ton of RV campgrounds and has been popular with RVers for ages. If you want to camp along a river, there are a gazillion options for places to stay! Hi guys! Love this post! Did you have a chance to check out the Desert Solar Bar we told you about when you were in the area? We didn’t end up making it there, Tara. I thought we might as we pulled out on our last day, but it didn’t happen. So it’s one more reason to return!! Every post ends up being my new “fav”. This is another great read and the pictures are so wonderful. 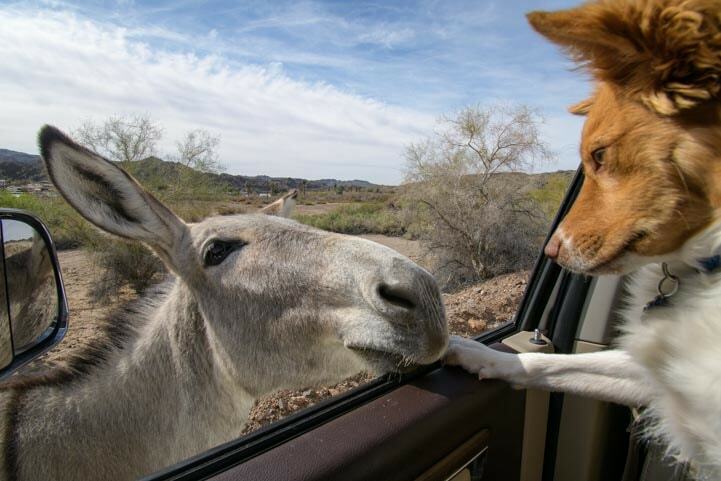 Loved “Buddy and the Burros”. Kind-of sounds like a good name for a late sixties rock band! Truth be told…I’m still dancing in the moonlight. That one created a weeks long ear worm, one that continues to make me smile. I’ve revisited that one a couple of times…..at least. Love the blog. Keep ‘em coming! That is so wonderful to hear, Jeff. Certain songs are so important and hold such lasting memories. 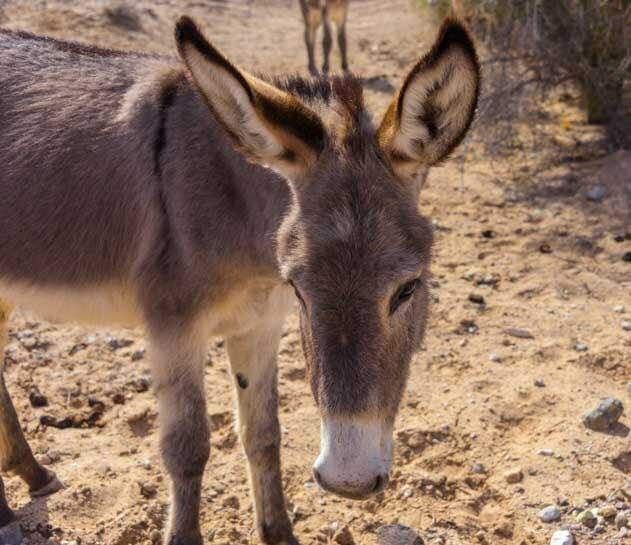 Watching Buddy with the burros was really fun. 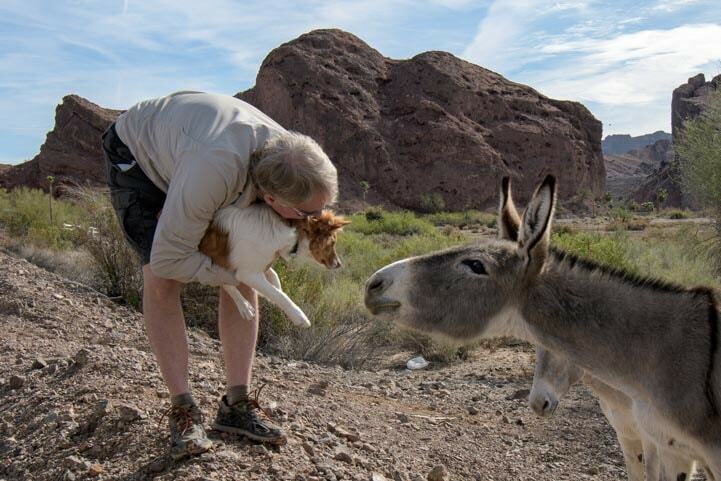 We actually came across another burro since then and he was just as eager to get to know it. Maybe he’ll create that rock band. 🙂 !!!! 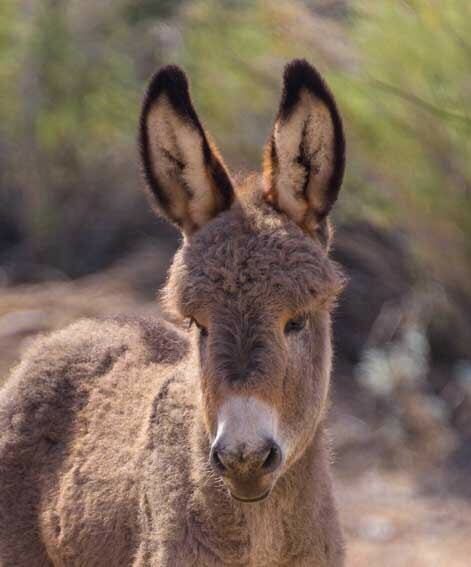 Well Emily, I used to be so envious of you and Mark (still am a bit) but we are finally full timing and we saw the burro’s this winter. Went hiking all through the Parker/Havasu area. If you are there in season go to the Desert Bar, you won’t regret it. Anyway we have been spending the last week at Havasu and took a day trip to Oatman, AZ. 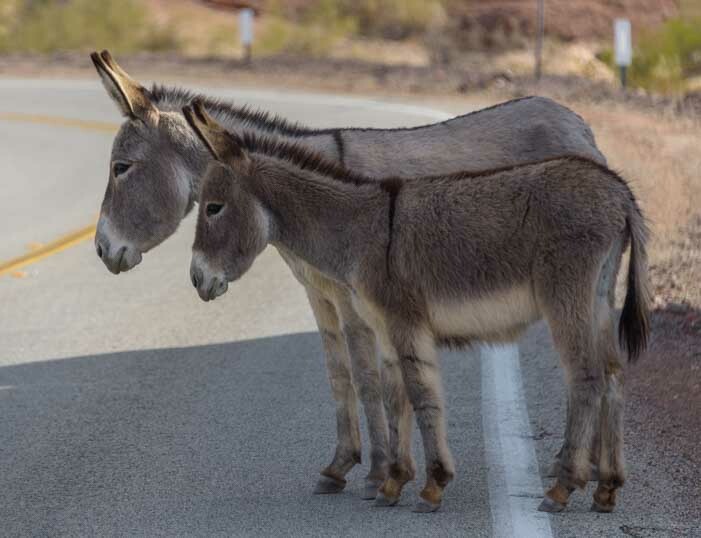 The burros roam the streets of this little western style town and you really get up close and personal with them. We got there early in the morning (9 AM) and got to help feed them there nutritious food (compressed alfalfa and apple crackers). They are just adorable and you should go see them if you haven’t already. How fun, Chuck, and congrats on launching your new adventurous lifestyle!! 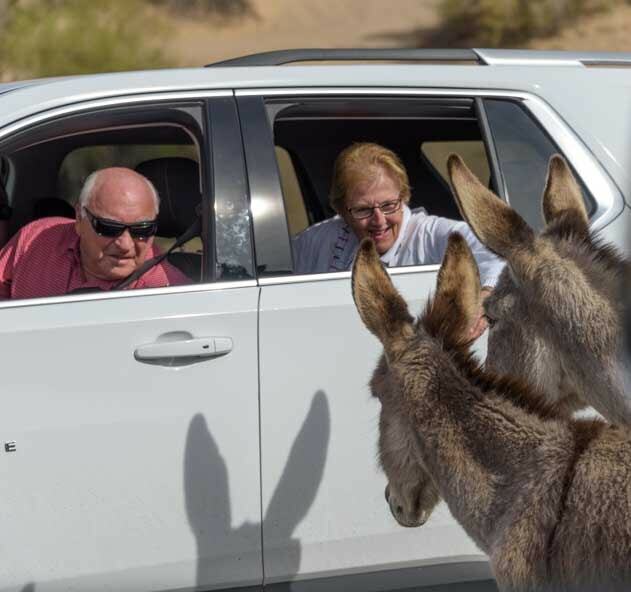 We’ve seen the Oatman burros in past lives but not since we’ve been out full-timing. I didn’t know you could help feed them in the early morning — what a blast that must be!! Thanks for the tip about the Desert Bar. We’ll check it out next time we’re in the area. Enjoy your full-time travels. It sounds like you’re already having a ball! !